Bronze-makers in Dai Bai Village have preserved their jobs for more than 1,000 years by expertly crafting their refined products. Trung Hieu and Gia Bao report. 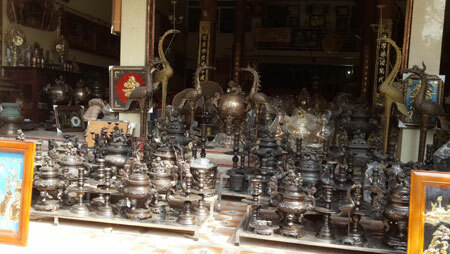 Dai Bai Village in Gia Binh District, in the northern province of Bac Ninh, has a tradition for bronze casting which is more than a thousand years old. The village, which is located on the bank of the Duong River, was famous because it was wealthy since ancient times, when it was called Buoi Village, and bronze casting has brought prosperity to the village for the past so many centuries. Should you come to Buoi Village and make bronze pots with us? Despite the inevitable rise and fall of handicraft villages, overcoming the vicissitudes of the society, Dai Bai Village even today reverberates with the sound of hammers of the bronze makers, the noise of vehicles belonging to traders, and prosperity that shines on the face of every villager. According to historical sources, the bronze casting craft appeared in Dai Bai since the early 11th century, thanks to its founder Nguyen Cong Truyen. According to Professor Bui Van Nguyen, former secretary general of Viet Nam Folklore Association, Nguyen Cong Truyen was a Dai Bai man who lived between the Tien Le Dynasty (980-1009) and the Ly Dynasty (1010-1028). At that time, the country's economy was in bad shape, and Truyen realised that the villagers were very poor. After many years of wandering to different regions and doing many jobs, he came back to the village in 1009. He brought the bronze-making job to his home village Dai Bai and taught all the secrets of the craft to his villagers. Soon after, Dai Bai became the "capital" of bronze handicrafts and even the Ly Dynasty had to ask them to make bronze items for the royals. After Truyen died, the Ly Dynasty thrice posthumously honoured him as God. The first products of Dai Bai were rudimentary household utensils such as pots, trays, and pans, which were forged from bronze. After more than four centuries of development, until the early 16th century, the village had five artisans who were invited by the Nguyen dynasty to make products for the royal family. As these people were concerned about the traditional craft of their motherland, they expanded production, and assigned tasks to others. Since then, operations in the craft village were expanded and developed a lot. Thanks to this assignment of labour, Dai Bai has been developed to its peak, reaching specialisation with divisions. One hamlet makes food trays, another makes brass pots and yet another specialises in buying materials. The techniques and designs also became varied and more sophisticated. The new models include worshipping tools, incense burners, and bronze statues. Dai Bai's bronze makers have their secrets which they do not reveal. That is why their products are bought by many traders who then sell them all over the country. As it also suffered from the vicissitudes of the market and the changes of the times, Dai Bai also sometimes suffered a recession, and they struggled to find an outlet for their products, deputy chairman of Dai Bai Commune People's Committee, Nguyen Van Quang says. "However, with the efforts of the villagers, the changes, improvements, and innovations in each product, and every detail, the products of Dai Bai Village have today regained their reputation, and the village is as crowded as before," he says. Dai Bai Village still retains its specialisations, with each area specialising in one type of product. For example, the Son hamlet makes worshipping tools and pots, the Tay hamlet specialises in food trays and gongs, the Giua hamlet specialises in making water pots and the Ngoai hamlet makes cooking pots. Products of Dai Bai still keep their brand name and make an impact on consumers in the country. Nguyen Xuan Huong, head of the craft village's Relics Management Board says the village now has 1,500 households with 8,000 people. "Among them, 800 households are directly involved in bronze-making. Our village has 2,400 bronze makers, including eight national-level artisans," he says. 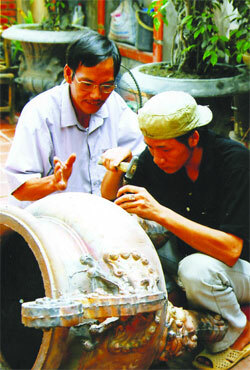 Huong says proudly, "In my village, even children know how to refine bronze. They know how to select different kinds of bronze, to process and manipulate items. What the villagers know best is the bronze craft." In every corner of the ancient village, visitors can hear the sound of the job and see the makers busy at work. In this village, people aged 50 can retire. Children learn how to do the job since they were little, and they can officially start working at the age of 15. At the age of 20 they can make the most refined items. Artisan Nguyen Van Luc says, "We have lived with fire. In our modern times, we do not need to be famous. We feel satisfied that we can make products both beautiful and durable, and that is enough." "We villagers have kept the fires burning for the past one thousand years making bronze products, and this has been our success," he said. Luc says villagers make their products during the summer to store it. "We sell our products in time before Tet Lunar New Year. At that time, vehicles belonging to traders crowd the village and all the products are sold out," he says. When asked about the know-how villagers learned from their history of 1,000 years, Luc and other artisans shake their heads. "Everyone has his secrets. But we cannot say it as we would be committing a sin to our ancestors.